The truth will make you odd. May God grant many years to his servant Sophia. What people are saying about this article: Enter your password to view comments. Originally uploaded by Kevin Basil. 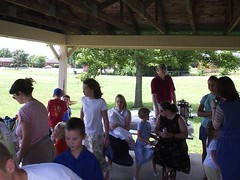 I posted photos from last Sunday’s Church School picnic. I’m beginning to really like Flickr a lot. 10JUN: checked out of NAVSUBSCOL and began the long trek south. Travelled until 2330 or so, then got a motel room. Pennsylvania traffic was insane; two multiple car accidents in a row. 11JUN: continued to head toward Lexington. Arrived at Dmitri and Anna’s around 1430. Almost ran out of gas at Daniel Boone National Forest. Had supper with the Powells. Good to see them again. 12JUN: birthday, and someone remembered. Wow. Now I’m 32 — THAT’S CRAZY. Picnic noted above, then pizza at Walthers. Went over to Powells to help Naughton watch The Two Towers and babysit. 13JUN: went into town to see recruiter. My recruiter has transferred; this was a huge letdown, mostly. Then to Joseph-Beth Booksellers. Good to see old friends. Watched BSG outtakes at Powells. Said good-bye to Timothy. 14JUN: went to prayers and breakfast with Fr. David. Bought a wireless router. Burned CDs of chant for the parish. Travelled 3 hours south; hail in south Kentucky. Beef Stroganoff for dinner — my favorite. Got router working; awesome! 15JUN: mostly putted about while Mom and Dad were in Knoxville for some chiropractic stuff. 16JUN: helped dad on a walkway project. Bought a new camera when I heard the amazing price of $150 for a 4.1 megapixel Fujifilm. Got TN driver license; now I have two proofs that I am a resident of TN so that DFAS won’t keep sending my money to Frankfort. Went to dinner with Dad. He took me to church to show me off; I think I took it well. 17JUN: continued to do walkway project. Took lots of photos with new camera. Finished walkway — as far as my contribution is concerned; Dad will need to do more later. Later tonight, we’ll see Cats at a local playhouse, then tomorrow I’ll get on the road to Indianapolis to see friends there. Close friends, you know what awaits me there. Please pray for the Lord’s will to be done. Although I have five posts being worked on currently, Bryan Peter infected me with a meme. I want to answer before I forget the correct answers. What bibliophile could possibly answer this question? I don’t even know how many books I currently own, much less how many I’ve owned over the course of my life! Two in tandem: The Priest’s Service Book , by Archbishop Dmitri, and Book of Akathists , published by Holy Trinity Monastery, Jordanville. Harder to see, that answer is. Either Beauty and Unity in Creation: The evolution of life by Gayle Woloschuk, or Against Heresies Book I by St Irenaeus. I can’t really recommend either of these very much. The book on evolution attempts to argue for the compatibility of science and faith, a position I favor, but the arguments felt like a badly edited Star Wars movie: everything went by so fast, with little actual argumentation to bolster her positions, with which I actually agreed. Against Heresies is several books long, and the translation I received from Amazon (which is in the Ancient Christian Writers series published by Newman Press) is merely Book I. I would recommend Proof of the Apostolic Preaching instead. Of course, I skip around a lot, so there are a ton of other books that I’ve started in the meantime. The Bible , by the hand of God through the prophets and righteous men and women of the old covenant, the evangelists, apostles and bishops of the new. Honorable mentions: Chronicles of Narnia , by C. S. Lewis; Brothers Karamazov , by Theodore Dostoevsky; The Journals of Father Alexander Schmemann, 1973–1983 , translated by Matushka Julianna Schmemann; Orthodox Spirituality , by Lev Gilet (alias a monk of the eastern Church); The Catechism of Holy Trinity Orthodox Church (EOC), by Randall Evans (self-published for local use); Christianity and Culture , by T. S. Eliot; The Ragamuffin Gospel , by Brennan Manning; The Shattered Lantern , by Ronald Rolheiser, OMI; The Galileo Connection , by Charles Hummel; Abusing Science , by Philip Kitcher. What people are saying about this article: 12 Thoughts by readers like you. When you wish only to be held and comforted, but you sleep alone again, remember that God was abandoned by his friends and hung to die. When you take up a cross that you do not think you can bear, another has borne a cross greater than yours. When your heart is pierced, one prays for you whose heart was pierced far more deeply. Where do you get the idea that the afflictions on the path do not belong to the path? Do you not wish to follow in the footsteps of the saints? Do you want to travel by some special path of your own, one that does not involve suffering? When you most feel that you are alone, know that you are not. If you have a child with a reactionary character, whatever you want to say to him, say to God first. Kneel before God and through the grace of God your words will be conveyed to your child…. Don’t pressure your children. Whatever you want to say to them, say it with your prayers. Children don’t listen with their ears. They’ll only listen to what we want to tell them when divine grace appears and enlightens them. When you want to say something to your child, say it to the Panagia [Mother of God] instead and she will do all the work. Your prayers will become a spiritual hug, which embraces your child and captivates them. Well, Lexington may not be Beulah Land, but it will be joyful to reconnect with my brothers and sisters at Saint Athanasius, my home parish which I helped found. I am most of the way there, blogging wirelessly from a hotel room in Morganton, West Virginia. I should have seen this all along. Now that I’m packing, I realize how I should have had my desk arranged for the last nine months. Maybe I’ll be able to tuck this epiphany back into my brain for use the next time. Also note that I’m testing Flickr.com to see what I think. I just learned a fact I find deeply disturbing. One of the bishops of our Church had a perfectly good English name before being tonsured a monk and elevated to the episcopate, but he was given an ethnic variant of the exact same name upon his tonsuring! Something akin to Fr. John taking the name Ioannos. Or Fr. Nicholas taking the name Nikolai. Something like that. Can I be frank? THERE. IS. NO. PLACE. FOR. THAT. This is truly outrageous. My heritage, I feel, has been insulted. How did it come about that you will go to Sitka and Russia now? His Grace was once my parish priest in Las Vegas. Like you, I was homeschooled–which allowed me to be more involved in the Church during the week. (Then) Fr. Nicholas really took me “under his wing” and significantly contributed to my desire to become a priest. Now that His Grace is a bishop I have the opportunity to continue to work “under his wing”. On August 8, 1970, he was tonsured a monk of the Lesser Schema and given the monastic name Nikolai. The following day, he was ordained to the diaconate. He was ordained to the priesthood on June 4, 1972 at Saint Stevan Serbian Orthodox Cathedral, Alhambra, CA. In 1988, Father Nikolai received a canonical release and was received into the ranks of clergy of the Orthodox Church in America. On November 13, 1988, he celebrated the first Divine Liturgy for the newly-founded Saint Paul the Apostle Mission. So, his grace Nikolai was given his name at his tonsuring as a monk. (Orthodox monks are given new names to emphasize their break from the secular world. They also do not use their family name any longer for the same reason; this is why monks and bishops put their surname in parentheses.) This is quite the opposite of what I originally concluded; apparently his grace went by the name Nicholas, in spite of having the monastic name of Nikolai, prior to being raised to the episcopate. I apologize for my previous statements, and I applaud his grace for doing the right thing in the mission context of Las Vegas. That is actually quite extraordinary. This amazing chapter reveals a little more of the real Priest-monk Seraphim, the flesh-and-blood man who won so many followers. Perhaps if I had encountered more of this man, and less of the reactionary Priest-monk Seraphim who decries everything modern, I would have more love and respect for his memory. A recent comment by Paige got me thinking about what, specifically, I find so distancing in Priest-monk Seraphim’s writing. What people are saying about this article: 14 Thoughts by readers like you. Tacitly acknowledging that the Geneva Conventions are not being followed to the letter, Air Force General Richard Myers disputes allegations of abuse nevertheless. Terrorism suspects held in the U.S. Navy prison camp at Guantanamo Bay, Cuba, are being dealt with “humanely” and with “dignity,” the nation’s top military officer says in disputing reported abuses. In television appearances Sunday, Air Force Gen. Richard Myers, chairman of the Joint Chiefs of Staff also said U.S. officials believe al-Qaida leader Abu Musab al-Zarqawi is wounded, but it’s not known how badly. Which essentially is what I have said in previous articles, along with others. The powers controlling the HVAC in the barracks have not yet seen fit to kill the heat and resurrect the A/C. It’s been a sweltering pit in my room. Until today. I augmented Little Boy there, which was admittedly doing little in terms of pulling outside air in. What can I say? Big Boy is a stud. Within an hour, it was cool in the room. I have had a similar experience by becoming a serviceman myself.